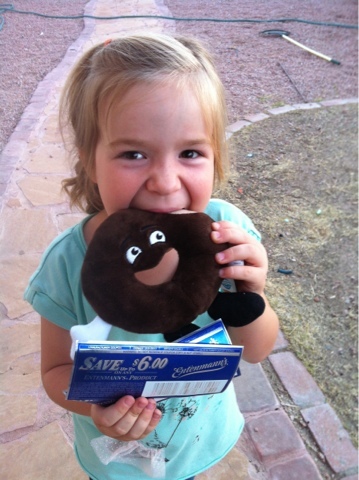 My Little Patch of Sunshine: National Donut Day & Entenmann's Giveaway! Today is National Donut Day and I have two $6 Entenmanns coupons to give away! National Donut Day has been celebrated for the last 75 years and was started by the Salvation Army as a way to raise funds for their social service programs. Entenmann's Bakery has made more than 4 billion donuts since it was founded in 1898. I think that's pretty amazing! One of my favorite Entenmann's donuts is the chocolate covered one. They have been making those since 1972 and it is their #1 best seller. Entenmann's is currently running a sweepstakes where you could win free donuts for a year! Check it out through this link! After you've entered the sweepstakes for a year's worth of donuts, enter my giveaway for a free box of yummy Entenmann's baked goods. I have two $6 certificates and I'll send one to two of my readers. Just CLICK HERE to pop over to my giveaway form and answer the simple, mandatory questions. Mandatory Question: What's your favorite donut? It's not required for this giveaway, but I would really appreciate it if you would like my blog's page on Facebook. You'll find me at www.facebook.com/mylittlepatchofsunshine Thank you!! And Good Luck! We love Entemanns at my house! I love the Devil's Food dounts and the the Raspberry Danish Twist. Entered the contest, will post on FB for my other friends to see! I'll try to stop by more often, Melanie. I like Chocolate covered donuts.